Being a new startup home services company, Approved Contractors knew that they would need to make a big impact when entering into the market. They would need a logo to represent their business, and professional, eye-catching vehicle wraps for their fleet of home service trucks. Luckily they came to the right place - Sunrise Signs. 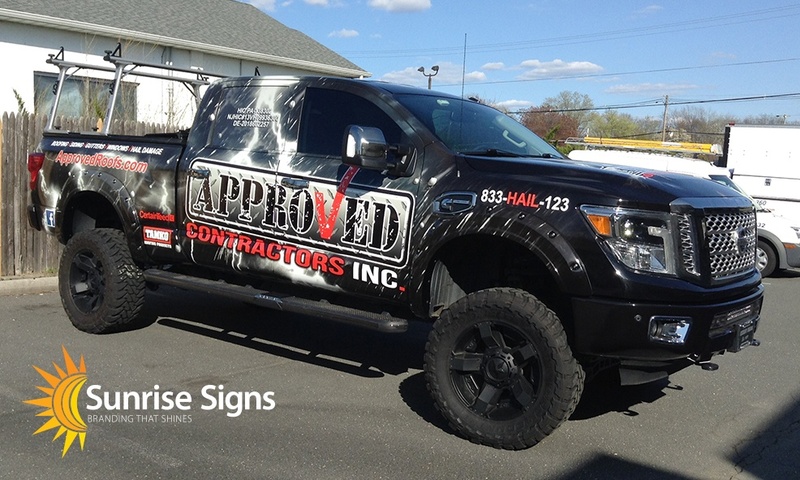 We helped Approved Contractors, Inc. design their new logo and get their vehicle fleet wrapped the right way! Since Approved Contractors, Inc. needed us to design a logo along with their vehicle wraps, our designers had a great opportunity to create Approved's new branding from the start. We got the ball rolling with a logo design consultation, which included us asking the customer about what they wanted to get out of a logo - what colors, materials, and elements were important to them as a company. From that initial consultation we went through several rounds of logo creation and revision, finally to arrive at their new logo! Logos designed by Sunrise Signs are typically in a vector format, which allows the logo to be endlessly resized and adjusted without losing any visual quality. This allows our clients to use their logos for a wide variety of different purposes, besides just vehicle wraps. Sunrise Signs designed logos can be use for business cards, websites, t-shirts, or any other medium where you need to place your logo! 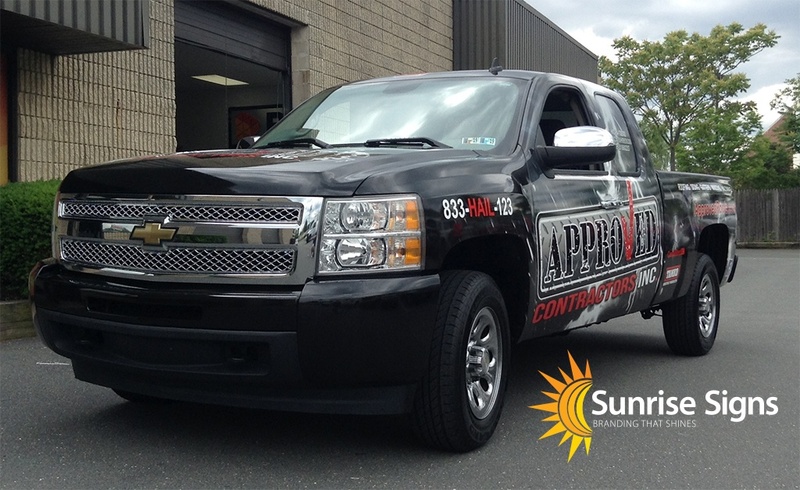 After creating the new logo for Approved Contractors, Inc. we then moved on to their vehicle wrap design. They wanted a design that would eye catching, exciting, and allow their new fleet of trucks to be recognized wherever they went. We were happy to oblige! Utilizing a full wrap on their trucks, every inch of Approved's vehicles are working for them and creating strong impressions. To take advantage of the full wrap coverage, our designers choose to use the high contrast of white and black, with a rainstorm and lighting commanding the background of the wrap design. First you get the logo, then you get the wraps, then you get the business! Despite the design having many visual elements, all the essential marketing information of the company can still be easily read on the wrap. While it's important to get the public's attention - it's even more important to deliver your message! To maximize the amount visual real estate on their trucks, we used a perforated window vinyl film for the side and rear windows of the truck. This way we were able to get the most out of the full vehicle wraps on their trucks. For this initial project, we wrapped four trucks for Approved Contractors, Inc. When we say fully wrapped, we mean it! 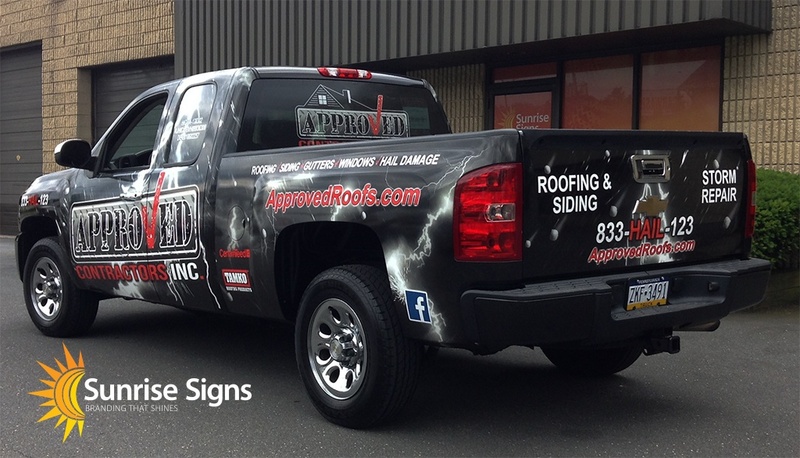 Approved went all in on their branding and wrapped everything they could on their trucks - roofs, hoods, sides, tailgates, and everything in between is now working for them! Perforated vinyl for the side windows lets us get the most out of every inch! Roof and hood...wrapped and ready to go! The only thing we didn't wrap was the rims! Of the four trucks we worked on, there were a few different body styles we had to accommodate. Our graphic designers made sure each wrap would have the same consistent look and installation, despite the trucks being from different manufacturers. 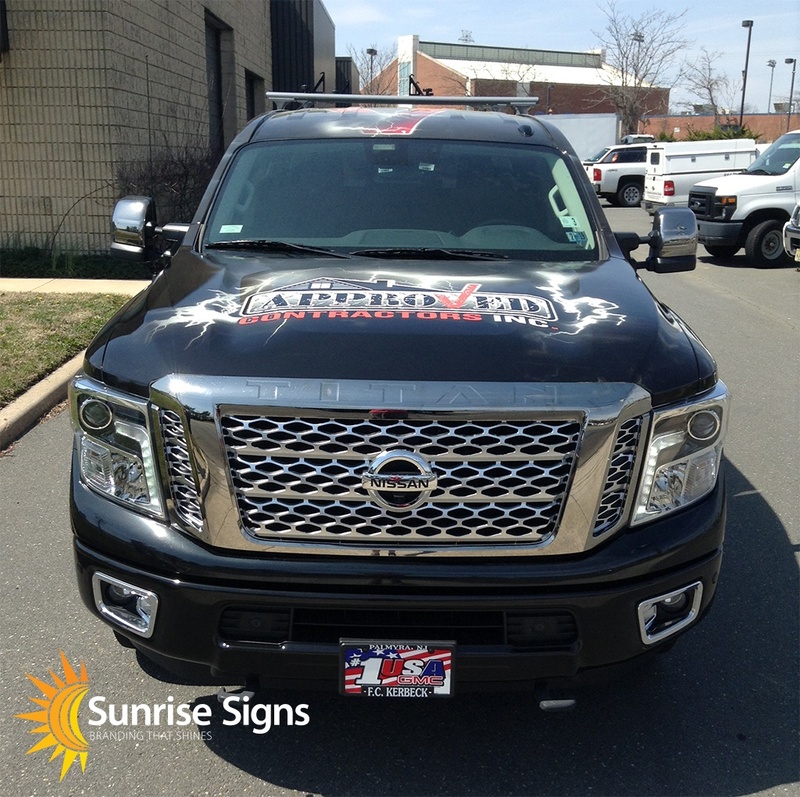 This attention to detail and consistency that put Sunrise Signs in a league of its own when it comes to fleet vehicle wraps! Amazing wraps are our business. Happy customers are our passion. Consistent fleet branding is one of the most important factors in mobile marketing. But this is especially true for new companies and startups like Approved Contractors, Inc. Since all their trucks share the same branding and design, no matter where they go they're creating strong, memorable, impressions to their current and future customers. "Great Company from start to finish. We here at Approved Contractors Inc, are extremely happy with the service provided by Sunrise Signs. We have had multiple trucks wrapped and more to come, they were done professionally and quickly." Are you a new business ready to make a splash in the market? Do you already have a company fleet, but just aren't getting the exposure you deserve? Give us a call today and let's have a conversation about how we can bring your fleet branding to where it needs to be.